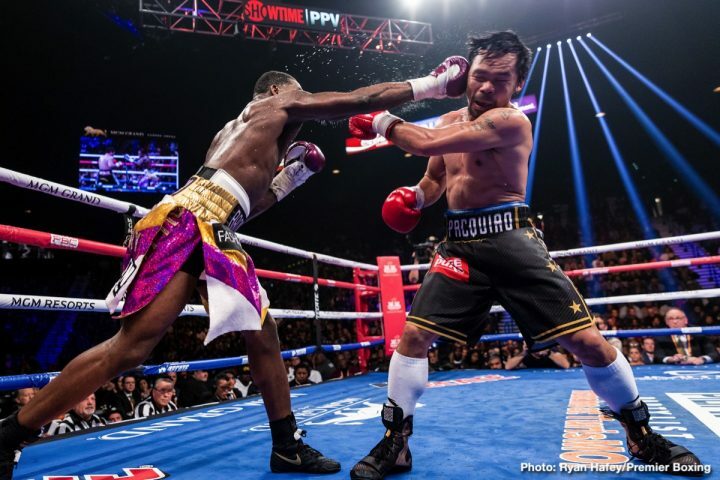 By Mike Smith: Manny Pacquiao’s career may be in jeopardy following his win over Adrien Broner last Saturday, due to an eye injury the 40-year-old Filipino star suffered, according to Yahoo News. There’s a possibility that Pacquiao (61-7-2, 39 KOs) suffered a detached retina in his left eye. Pacquiao, who holds the WBA World welterweight title, will be traveling back to the Philippines to have his eye examined. It’s unclear why Pacquiao is going to wait to see a specialist in the Philippines rather than have the eye checked before he takes the long flight back home. Pacquiao’s injured eye will need to be examined by a professional before the fans know what the problem is. If it’s a detached retain, it would mean surgery, and a period of time out of action. Given Pacquiao’s age, he doesn’t have a lot of time to sit out of the ring or an extended period of time while his eye slowly heals. If Pacquiao wants to continue fighting bad enough, it won’t be a problem for him to return to the ring after his eye problem is taken care of. The manner in which Pacquiao beat Broner showed that he’s still one of the elite fighters in the welterweight division. Pacquiao “complained of pain and vision loss in his left eye on Sunday morning,” according to Yahoo Sports News. During the post-fight press conference last Saturday night, Pacquiao was grimacing with a look of pain on his face, and dabbing at his eyes with a handkerchief. At the time, it was believed by some that Pacquiao was just dealing with a cold that he came into the fight with, but it now appears that it could be a serious potentially career-ending eye injury. An eye injury of this magnitude for Pacquiao would mean that a second mega-fight between him and Floyd Mayweather Jr. is out of the question for the time being. Going into the fight with Broner last Saturday, there was talk of a rematch between Pacquiao and former six division world champion Mayweather (50-0, 27 KOs) for later this year on September 14. That fight won’t be happening for the time being with Pacquiao’s eye injury. Pacquiao easily defeated Broner in his first defense of his WBA welterweight in Las Vegas, Nevada. The performance by Pacquiao showed that he’s still at the top of his game. No one had ever beaten Broner in such a decisive manner as Pacquiao did. After the fight, it was learned that Pacquiao had fought with a bad cold. Coming back from surgery on a detached retina is possible. It’s been done before by fighters, but it could be more difficult for Pacquiao because of his age. He’s already working full time as a senator in the Philippines. During the fight last Saturday, Pacquiao’s home in Los Angeles, California was broken into and money and jewelry was stolen, according to Yahoo News. There was no one home at the time of the break in.